The holy grail for most troll collectors are the trolls made by Thomas Dam. His designs features some of the most unique and cute trolls. I have made a separate section for Dam Troll Animals so they are not covered here. 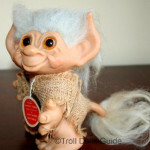 The vintage original Dam trolls were made of a hard vinyl material and the hair was made of mohair. The American version was a harder vinyl than the European version. Most of the trolls had a lot of hair. The clothes were made of felt. There were some standard sizes. The most popular size was the 3 inch troll. The 7 inch banks were also popular in the 1960′s. When you search for Dam trolls on the internet, you will also get Norfin trolls. Yes, they are made by the Dam company but they were distributed under a different company name. They were made in the 1980′s and 1990’s. I have included Dam trolls sold under the Norfin name in this section. You can read about Norfin trolls on their page but the trolls are included in this section.